The Cable Car Home Page - Electricity in the Far West III -- Kansas City. Electricity in the Far West III -- Kansas City. This article, from Electricity, November 2, 1892, describes the changing transit situation in Kansas City, Missouri and Kansas. I like the author's description of the geography of Kansas City and of the common problem of building too many transit lines. 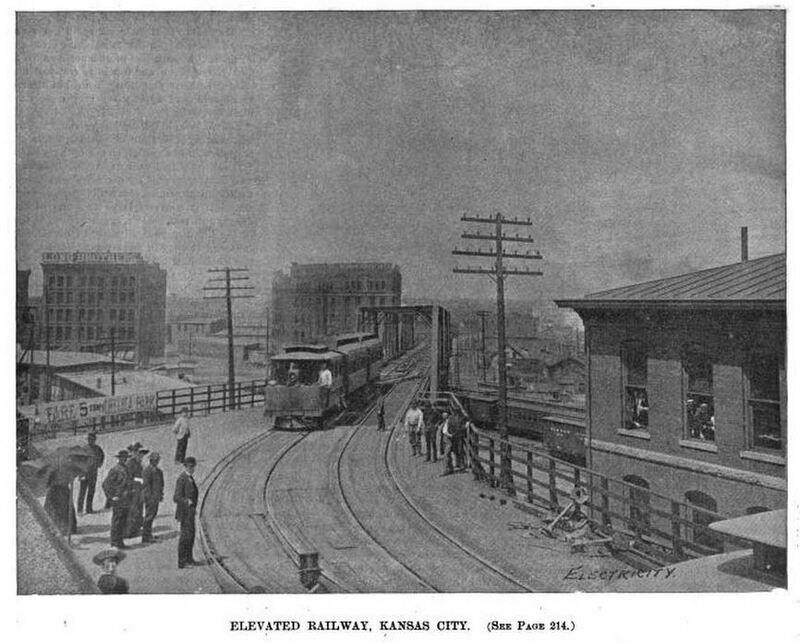 The Kansas City Elevated Railway was the successor to the Inter-State Consolidated Rapid Transit. Electricity in the Far West III. A pessimist may be defined as a person who always looks on the dark side. The cloud has no silver lining for him, or if there be a silver lining it merely serves to throw into deeper contrast the blackness of the cloud. We are not pessimists, rather are we optimists, but we have often been amused and interested by the ingenuity displayed by some people in detecting faults and blemishes in what to others seems fair and beautiful. When a plate is exposed in a camera facing an unshaded window or a brilliant light, it shows, when developed, a glare or halo which obscures or obliterates the surrounding shadows. The camera is an optimist. The pessimist reverses matters and causes the surrounding shadows to obscure the light, thus making sombre what should be bright. "You know," he said, "Kansas City has the misfortune to have had a boom. You also know that a great deal of Eastern capital has been invested here. Much of it was placed in legitimate enterprises, but some of it was not. Now, a boom always discounts the future. Prices, plans, hopes and expectations during such seasons always transcend all reason. The community becomes intoxicated, as it were, and the more fuel they pile on the bigger the headache they are laying up for to-morrow. With real estate investments, many of which were legitimate, there naturally followed street-railway investments, some of which at least cannot be classed in the same category. For instance, a syndicate buys largely of real estate in Alpha street -- a small, unimportant byway, scarcely to be dignified by the term "thoroughfare" -- and straightway the same syndicate, or another, gets a franchise for and builds a street-railway line along this route, to bring this property into the market. This they do notwithstanding the fact that an old-established line runs on Beta street, but one block away; but street-railway investments are good, they argue, and even if the line doesn't pay at first, it will pay when Kansas City grows; and then, too, it will sound so much better in describing our property to say that the street cars pass the door; the enhanced value of our property by reason of this will more than repay us for the initial losses. Thus roads have been built for which there was no real need, and while cumbering the streets, and affording accommodation to a comparative few, have still diverted the limited traffic from the more important routes sufficiently to make serious inroads on their receipts. We are having our headache now, and it has been a bad one. We are getting over it, however, but Kansas City has enough street-car lines now to supply the city as the boomers pictured it, and too many for the city as she is in reality." We are sure that there are many who do not agree with this gentleman, nor would we venture to subscribe to or indorse his views ourselves, but merely give his statement as one of the curiosities one occasionally runs up against. We were not hunting for a declaration like the one quoted, and it is doubtful if we could have found it if we had hunted the country over, but having left our gun at home, like the cowboy, we ran right up against it. Kansas City is a place of hills, and the first thing one sees on entering it by the railroads is a steep bluff skirting the river upon the top of which the city proper is built. This bluff is surmounted by numerous inclined planes or viaducts having grades of from 18 to 25 per cent. ; but even when one has ascended to the higher levels he does not find a plane, but a decidedly rolling country with ups and downs rapidly succeeding each other on almost all the streets of the city. The same cause, therefore, which led to the introduction of the cable system into San Francisco was also operative here, and Kansas City is so thoroughly covered with cable roads as to entitle it to the appellation of "The Cable City." This same cause, too, has militated against the introduction of the electric system. Most of the inclined planes are far too steep for any self-propelled vehicle to mount, unless some such system as that employed on the Pike's Peak road were employed, and many of the other grades are so steep as to create serious doubt, in the minds of laymen at least, of the practicability of the trolley in such places. Leaving out of consideration the ascents to the top of the bluff, however, we saw no grades which the electric car could not success fully surmount. In Cincinnati there is one grade on the Mt. Auburn line of 13.2 per cent, on a 30foot radius curve, and this is in constant use by electric cars carrying heavy loads, but it is an extreme case and approaches very closely to the limit. The cable undoubtedly has a distinct advantage where heavy grades are concerned; 1st, in that it is applicable on those which are entirely too steep for self-propelled cars, and 2d, because the weight of a descending car counterbalances and assists an ascending car, while the electric car, although it converts large amounts of kinetic energy into potential energy in getting to the top of the hill, throws it all away in descending by frittering it away in heat through the agency of the mechanical brake. Unquestionably the greatest defect in our present methods of electrical traction is that we absolutely throw away the energy that might be stored in potential form while descending a hill. Our electricians are squabbliug over the relative losses in rheostat and field regulation, and are lying awake of nights endeavoring to devise means of saving a per cent, or two in the losses due to gears, yet but little attention has been paid to the enormous loss due to the non-utilization of the energy of the descending car. We can recall to mind but two engineers who have given this most important subject any serious attention. They are Prof. Sidney Howe Short and Mr. Nelson W. Perry. The former put his ideas into actual operation, and demonstrated beyond peradventure the practicability of utilizing the energy of the descending car. The economy resulting from this was so great that he guaranteed in his circulars that a road operated by his system would consume not to exceed 50 per cent, of the energy required by other systems. The same thing was demonstrated in England. But there were radical defects in his system which caused its abandonment on other grounds than the one upon which he based his claims. The latter engineer, Mr. Perry, has not yet put his plans into operation, but described his system in great detail in a paper read before the American Institute of Electrical Engineers at their Chicago meeting last June. He strikes out on an entirely original line, and with the difficulties which Prof. Short met before him, seems to have entirely avoided them. Both of these gentlemen employ the series system of distribution, for by this method alone can the desired object be accomplished. It is true that the energy of the descending car may be stored up in multiple arc systems by employing accumulators, but the losses due to additional conversions and other complications have precluded the serious consideration of this plan. We have digressed considerably from the immediate subject in hand, but plead as an excuse the suggestiveness of the hilly streets of Kansas City for a few remarks on this most important problem -- electric street railway economy. Under the existing conditions no one will be surprised that the trolley has made but little progress in Kansas City, but it is winning its way. The entering wedge has been driven, and it is there to stay. There are already five lines of electric road, viz. : the Armourdale (Metropolitan), the Vine Street, the West Side, the N.E. Line and the Kansas City Elevated Railway. Of these, the West Side (Rae system) and the Elevated Railway are the most important, both on account of their mileage and on account of other features of intrinsic interest. THE KANSAS CITY ELEVATED ROAD. This road consists of a main line with several branches which have been built at different times and whose history furnishes a good example of the evolution of the street-railway of the present day. The original elevated railway, commencing at a point near the Union Depot and extending to Edgerton Place in Kansas City, Kansas, was constructed in 1887. Only about two miles of this line, where it crosses the low lands near the depot and the valley of the Kaw River, is elevated, the remainder being a surface road, but throughout its whole length it is operated by small locomotives similar in every respect to those employed in Brooklyn, New York and Chicago. In 1888 this road was continued three-quarters of a mile, at the Missouri end, as a oable road, to the corner of Delaware and Eighth streets, the present Missouri terminus. In order to make this connection, a tunnel 800 feet in length through the bluff was necessary, and here and for this distance the steepest grade on the route, 8.9 per cent., is encountered. In this same year the Grand View branch, one and three-quarters miles long and leaving the main line at Riverview station, was constructed as a cable line, but afterwards abandoned as such and operated up to the present time by locomotives. Another branch, known as the Chelsea Park branch, leaving the main line about half a mile from the Edgerton Place terminus, was also constructed in 1888, and operated by locomotives. In 1891 still another branch, running from Riverview station to Armourdale, was constructed, and on this electricity was used from the start. Certainly no company has had a better opportunity of comparing the relative merits of the various methods of street-car propulsion than this one, for they have employed them all, except horses and mules, which from the start were too slow for Kansas City. This company has also had experience with all kinds of traffic. Edgerton Place and Grand View are fashionable residence suburbs. On these lines they catered to a fastidious clientele. Chelsea Park is a public resort. Here they catered to the pleasure seeker, and on the Armourdale line they carried the conservative and practical business man and pork-packer. The requirements on this line were the most exacting of all, and it is to the credit of electricity that it not only met them satisfactorily, but met them so satisfactorily as to determine the management to throw everything else out, locomotives, cable and cable driving machinery, and substitute electricity on all of their lines. Much if not most of the credit for all this is due to Mr. Warterman Stone, the general manager of the system. Mr. Stone is a far-seeing man and while safely conservative does not carry his conservatism in front of him as a stumbling block to his company's progress, but drags it behind to serve as a block or chuck to prevent retrogression. With him, to stand still is to go backward; and he had no sooner become thoroughly satisfied from his experience on the Armourdale branch that electricity was better than either cable or steam than his decision was formed, and neither the capital invested in the other systems nor local prejudice was allowed to stand in the way of action. We have on one or two other occasions in the course of this series of articles compared the enterprise of the West with the inertia of the East. It is certainly refreshing to meet with such instances of push, and we are pleased to adduce at this point another instance which cannot fail to emphasize the contrast in still stronger colors. While New York and Brooklyn have talked and talked of changing the motive power from steam to electricity on their elevated railroads -- in fact, have talked for years of the change -- Kansas City has "been, gone and done it." 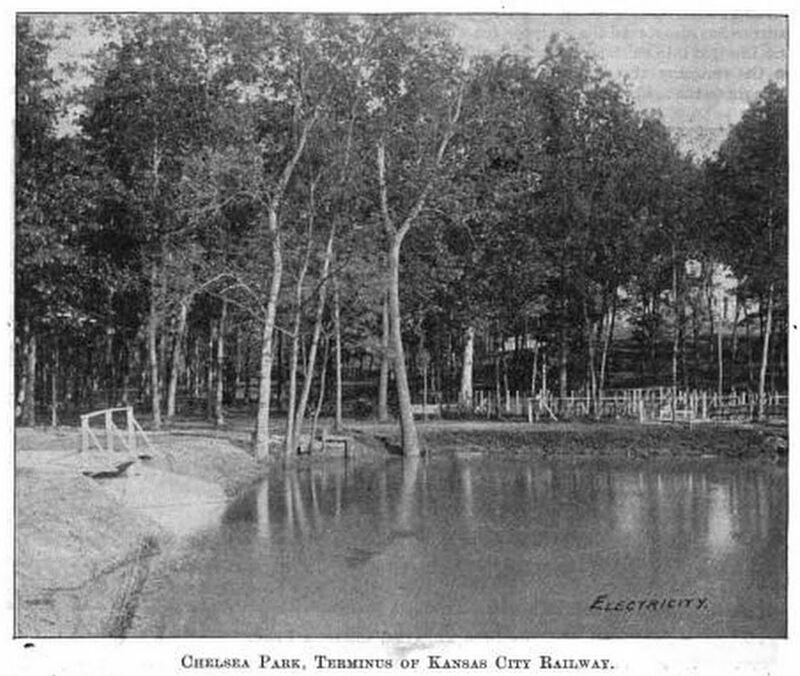 The whole system of the Kansas City Elevated Railway Company is now undergoing a metamorphosis, and in fact four and one-half miles of single track road, formerly cable, is already operated by electricity and the remainder is poled and wired, only awaiting the arrival of the motor cars and additional dynamos to be put into service in the same manner. There has been so little talk and so much business in connection with this change that we believe the other electrical journals have not even yet gotten "on'' to it, and this announcement of the fact after its accomplishment is probably the first made to the public. When the change is complete, this company will have nineteen miles of single track road operated by electricity. The original Armourdale line was equipped with Thomson-Houston apparatus. The new equipment will be a combination of the Thomson-Houston and Edison; that is to say, it will be the General Electric Company's system. There will be twenty-six motor cars, each equipped with two 30 H. P. single-reduction Edison motors. The car bodies will be twenty-three feet in length, of the Pullman make, and will be supplied with the McGuire maximum traction truck. This equipment will replace thirteen steam locomotives and trains of two cars each, besides the cable equipment now in use. The power will be supplied by three Thomson-Houston multipolar generators of 300 K.w. each. Where the T rail is not used on their own right of way, as for instance on that portion of the line operated on Eighth street in Kansas City, Mo., the old-fashioned flange rail is being replaced by the duplex. This, as the name would indicate, is made up of two separate and distinct rails, both T shaped but without the broad base of the ordinary T rail. One of these portions forms the usual flange and the other the head of the composite rail -- the two breaking joints and keyed together at frequent intervals. The whole is supported on chairs, four feet apart, resting, not upon ties, as is usual, but on the ground itself, thus doing away entirely with timber in the construction of the roadbed. Throughout the length of their line, on the elevated structure as well as the surface roads, the trolley wire is supported overhead on poles. The feeders, which vary in size from 0000 to 0, are, however, on the elevated portion of the structure suspended beneath the roadbed. On the elevated road and on a considerable portion of the surface road the centre-pole construction is used for supporting the trolley wire. The latter is divided into sections of about a mile in length and electrically disconnected from each other. Each of these sections is fed at every alternate pole from a subsidiary feeder, which in turn receives its current from a main feeder. In this way in case of fire along the route, by cutting out the feeder supplying the contiguous section, the wires become entirely inert and may be handled with impunity by the firemen. Also in case of breakage of the trolley repairs can be made without interfering at all with the other portions of the road. The Kansas City Elevated Railway Company have not been slow to appreciate the advantages accruing in a business way from special attractions along the lines of their road. In fact, the question of "induced traffic" has not only received their special attention but been solved in a manner highly satisfactory to themselves and to their patrons. At the terminus of their road, five miles distant from the power station, they acquired a large tract of land which they have developed into a beautiful park. 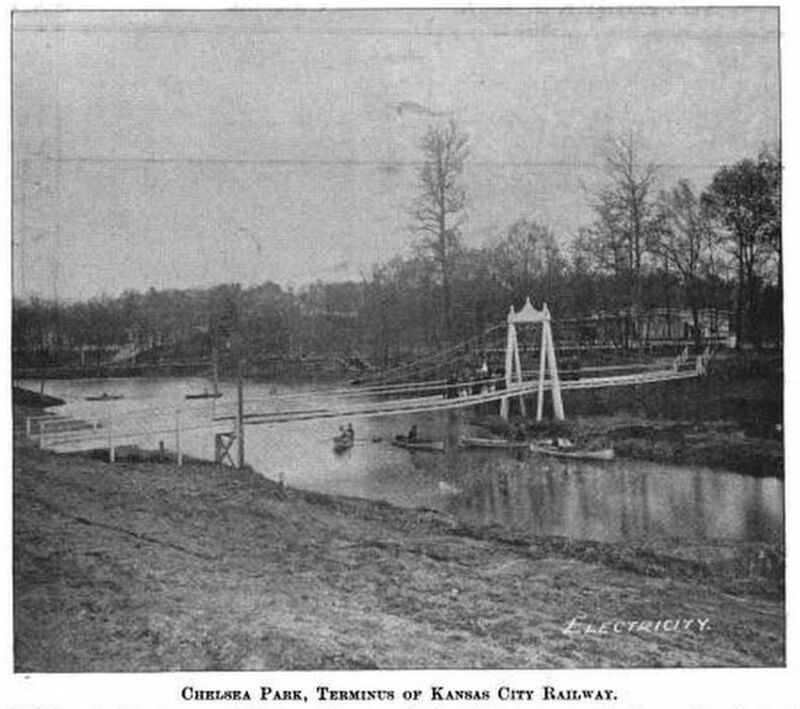 Although the conventional phrase that "hither the multitude throng from the crowded city" is not strictly applicable here for the reason that Kansas City is not a crowded city, still Chelsea Park, for such is its name, is an exceedingly popular resort among all classes of respectable people during the heated months of summer, and besides being a blessing to its patrons has also served the purpose for which it was brought into existence by proving profitable to the company through the patronage it has brought to the road. Chelsea Park, which forms the subject of several of our views this week, has been beautifully laid out in shady groves threaded by romantic walks, with here and there little lakes crossed by picturesque bridges and supplied with pleasure boats. In fact, it forms an almost ideal sylvan retreat. As if to add to a realization of a primeval state, of which it is a skilful reflection, a zoological garden has been added where a fine collection of animals, both in their wild and in their semi-domesticated state, may be studied at one's leisure. 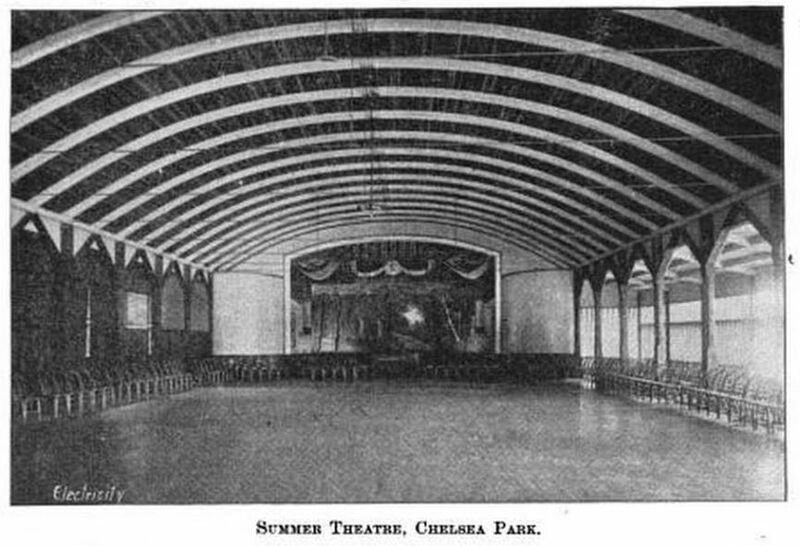 Not unmindful of those who do not believe in a complete renunciation of civilization and a reversion to the savage state, even for an hour, but who prefer the less arduous amusements of the present day, the company have erected in the park a summer theatre or opera house, after designs by Mr. Stone. Three sides of this building are arranged so that they may be thrown open to the summer breezes, or closed as a protection against the inclemencies of the weather, as the case may be. At one end is a stage, fully equipped with footlights and scenery, and the floor of hardwood is kept carefully waxed. The building is lighted throughout by electricity, and during the summer months is the scene of theatrical and operatic entertainments and balls and parties. With this, the groves, the lakes and rowboats and the zoological garden, one cannot fail to find for a time forgetfulness of the busy world and relief from the cares of business. Copyright 2017 by Joe Thompson. All rights reserved.